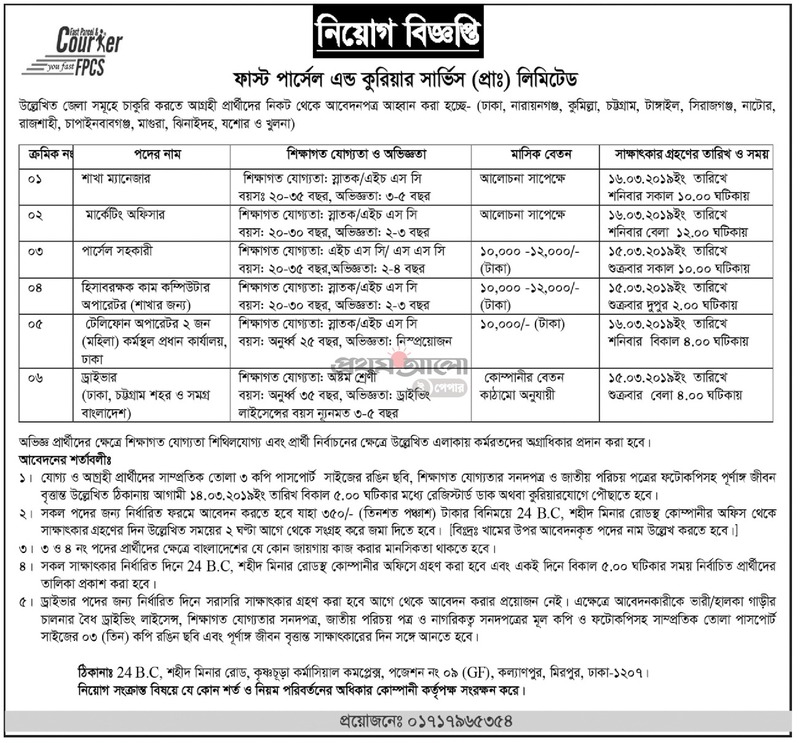 Jobs from First Parcel & Courier Service Private Limited has been published..Hope you will get the truth and detailed news through us.First Parcel & Courier Service Private Limited has circulated job circular in recent times.This is your chance to share your story and connect with job field in our country. As a hoping for a job, you’ll represent your skill and qualification. You can not apply online or via email or directly through the post office its direct interview. First Parcel & Courier Service Private Limited authorities published the notice for jobs in their team. Our Lekhaporabd Jobs team has converted the notification into an image so that you can download and read later. Below is a short summary and you can see the full picture of the notification below. To download the image, click on the image to save image or give a screenshot. We always try to provide best service for our valuable customers. Our company is located in Motijheel commercial area, Dhaka serving our customers from 2000. We provide highly reliable parcel and express services as well as value-added customer-specific total transport solutions. The company provides a professional courier services to their businesses partners which are designed to be cost effective. With excellent customer service, Customers can count on us to deliver best performance on their behalf. We always provide our services with our some very much professional employees. They know how much valuable your documents or parcels’ are.So try to visit our office or call us at: +88 02 47112906-our executives will reach your door instantly to collect your valuable documents.